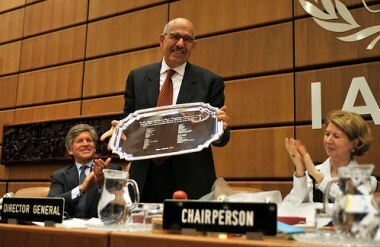 The governing board of the International Atomic Energy Agency (IAEA) has paid tribute to director general Mohamed ElBaradei, ahead of the confirmation of his successor Yukiya Amano. On 10 September ElBaradei said he was "humbled, grateful and honoured" by comments from the 35 board members. In a speech he recalled the challenges and successes of his 12 years at the head of the IAEA which has gone through a "metamorphosis" to "become a major player in the international community." A motion was approved that will see ElBaradei granted the lifelong title of Director General Emeritus. Speaking to the board members he said: "We know the difference between what's right and what's wrong and we are all committed - meaning all of you - and we are absolutely determined to make sure that we do our utmost for the benefit of humanity." In trying to create the right environment for global development while preventing proliferation of nuclear weapons, the member states of the agency are "Working together knowing that, as a human family it is not a zero sum game - we are either going to win together or fail together." 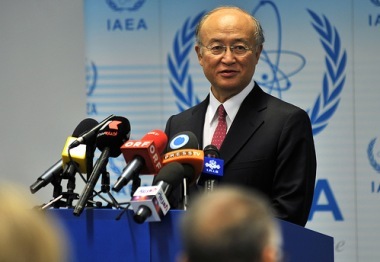 And today on the opening day of the IAEA General Conference, a vote of member states confirmed Yukiya Amano as ElBaradei's replacement. Amano lauded ElBaradei's "tireless efforts and selfless dedication towards world peace and prosperity." "As science and technology continue to advance, as knowledge expands and spreads, and as the movement of people and commodities becomes more salient, the world faces increasing risks of nuclear proliferation and nuclear terrorism. It is unlikely that this trend will ever be reversed, but rather it will continue to accelerate. Therefore, we must make further efforts to offset this trend by universalizing and further strengthening the nuclear non-proliferation regime, especially the IAEA's safeguards system." Amano will take ov er from ElBaradei on 30 November. Funding remains a major concern for the organization, which must maintain many technical cooperation programs to enable full benefit is made of nuclear energy, while also conducting exhaustive checks to ensure no civil nuclear materials are ever diverted for military use. Amano said: "Waste of resources, if there is any, must be eliminated. Communication between the secretariat and member states and between different branches of the secretariat must continue to be improved to enhance efficiency and remove duplication. These efforts are particularly needed should the General Conference approve the increase in the agency budget despite the difficult global economic situation."